Oklahoma! is a classic musical. In fact, it’s often thought of as the one that really made “musical theatre” a thing, at least in its modern sense. It’s 75 years old this year, and to celebrate its anniversary, many theatre companies across the country are producing the show. Here in St. Louis, it’s on at STAGES to close out their 2018 season, and the production is all that could be hoped for in a staging of this show. It’s a tradititional staging, for the most part, but being on a smaller scale than most productions of this show I’ve seen, it brings an immediacy and clarity to the relationships that is refreshing, and the casting is about as ideal as I could imagine, especially in the two lead roles. The story is well-known to essentially anyone who knows the history of musical theatre. Set in the Oklahoma territory at the turn of the 20th Century, it follows a collection of characters and their lives and loves as the world is in the midst of an era of change, both technological and social. The cowboy Curly (Blake Price) is sweet on Laurey (Sarah Ellis), and she’s sweet on him, but they’re both awkward about admitting that. Laurey, who lives on a farm with her Aunt Eller (Zoe Vonder Haar), also has another admirer–mysterious, somewhat menacing farmhand Jud Fry (David Sajewich), but Laurey accepts Jud’s invitation to a town social event to spite Curly, even though she soon regrets her decision. Meanwhile, Laurey’s romantically adventurous friend Ado Annie (Lucy Moon) has her own dilemma–having to choose between her cowboy sweetheart Will Parker (Con O’Shea Creal), who wants to marry Annie, and traveling peddler Ali Hakim (Matthew Curiano), who is being pressured by Annie’s father (John Flack) to marry her. Some of the situations are awkwardly stereotypical by today’s standards, but for the most part it’s an entertaining representation of a bygone era both in terms of history and musical theatre, although the casting especially for Curly and Laurey has brought out a sense of timeless immediacy to the story that I haven’t seen as much before. I’ve seen this show several times before, and I’ve never seen a Curly and Laurey with better chemistry than Price and and Ellis in this production. Every time they are one stage together, it’s electric, and every scene they have together is believable, crackling with emotional energy and attraction, bringing real magic to moments like “The Surrey With the Fringe On Top” and “People Will Say We’re In Love”. Price is an affable, charming Curly and Ellis is a somewhat more deadpan sarcastic Laurey than I’ve seen before, and her more reflective moments are credible as well. In fact, the dream ballet, with Ellis dancing herself opposite a “Dream Curly” (Nicolas De La Vega) puts the focus on Laurey even more so than other dream ballets I’ve seen. It’s an especially memorable, expertly danced moment. The always excellent Vonder Haar is impressive here as the devoted, spunky Aunt Ellerl, and Moon, O’Shea, and Curiano give strong comic performances in their roles as well. Sajewich is an appropriately broody and menacing Jud, and there’s also an excellent, energetic singing and dancing ensemble to back up the leads, with some impressive choreography by Dana Lewis on big, memorable production numbers like “Kansas City”, “The Farmer and the Cowman” and the title song. 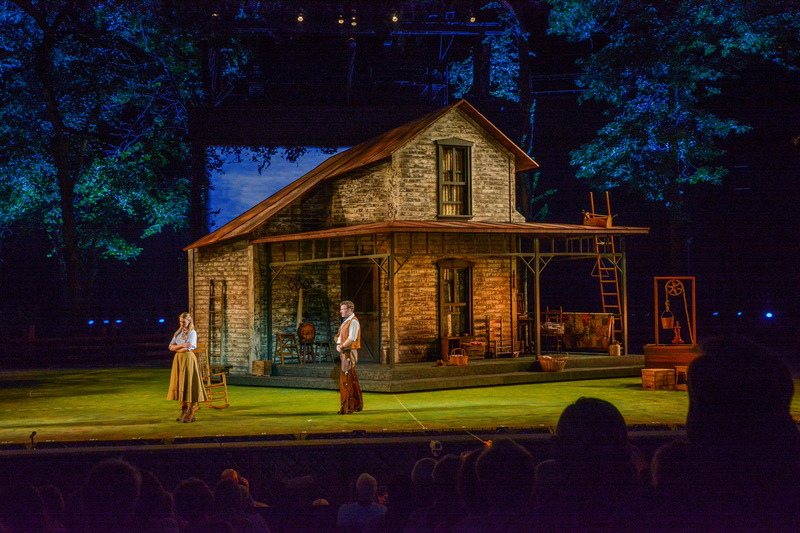 Visually, this production is simply stunning, with a set by James Wolk that brings the Oklahoma prairies to vibrant life on stage, with some truly impressive dimensional scene painting and striking, stylish lighting by Sean M. Savoie. There are also colorful period costumes by Brad Musgrove that serve to celebrate both the era in which the show takes place and the 1940s costume design of the orginal Broadway production. It’s a great looking show, in keeping with classic and timeless style. This is, simply stated, a fantastic Oklahoma! I especially like the particular focus on Curly and Laurey here, since other productions I’ve seen seem to have them overshadowed by the comic subplot. Even though the comic plots are well-done, the real stars here are Price and Ellis, and their love story makes more sense with these two than it ever has before, at least in productions I’ve seen. It’s a remarkable, vibrant production, appropriate for a 75th anniversary of an important classic musical. Go see it. It’s a whole lot more than just “OK”. STAGES St. Louis is presenting Oklahoma! at the Robert G. Reim Theatre in Kirkwood until October 7, 2018. The Sound of Music is unquestionably a musical theatre classic. Since its debut on Broadway in 1959, it has been performed in various productions around the world as well as two live television productions and, of course, the Oscar-Winning movie. I personally have seen so many productions of it that I’ve almost got the show memorized. Audiences generally know what to expect when they see this show. With the new touring production now on stage at the Fox, director Jack O’Brien has brought a good mixture of timelessness and immediacy to this time-honored show, as well as finding a promising young star to lead the cast. Everyone knows the story, it seems. As Maria (Kerstin Anderson) finds it difficult to fit in at Nonnburg Abbey, the Mother Abbess (Melody Betts) decides the young would-be nun needs to see more of the world. So for that purpose, Maria is sent to be a governess to the seven children of lonely widower Captain Georg Von Trapp (Ben Davis), who since the death of his wife has become more of an authoritarian commander than a father to his children. Maria soon wins her way into the hearts of the children and, eventually, their father as well, despite the romantic efforts of the wealthy widow Elsa Schraeder (Teri Hansen), who also wants to marry the Captain. And then there’s the Captain’s enterprising friend Max (Merwin Foard), who hopes to recruit the children–whom Maria has taught to sing–to perform in a big music festival. And then comes the Nazi occupation of Austria, and the drama that follows. Kerstin Anderson follows in the footsteps of many a Maria, including stage legend Mary Martin and the movie’s iconic Julie Andrews. Anderson, thankfully, doesn’t try to imitate her famous predecessors, although she has a quirkiness about her that is more comparable to Martin than to Andrews. She also has a youthful, energetic spirit and a great voice. As Maria navigates her road from the convent to the Von Trapps’ villa, Anderson visibly matures and acquires a sense of grace and poise. It’s an impressive performance, although she also occasionally tends to deliver her lines in an over-rehearsed, somewhat artificial manner. For the most part, however, she makes an excellent Maria, and she has great chemistry with Ben Davis’s charming, authoritative but increasingly boyish Von Trapp. Their love duet “Something Good” is very sweetly sung and their showcase dance charged with romantic tension. Davis also gets one of the show’s best moments when he leads his family in singing “Edelweiss” at the concert. There’s also a strong comedic performance by Foard as Max, and Betts as the Mother Abbess radiates kindness and strength, stopping the show with a soaring rendition of “Climb Ev’ry Mountain”. Other standouts in the cast are Paige Silvester as a particularly rebellious eldest Von Trapp daughter, Liesl, and Svea Elizabeth Johnson as the wise, observant daughter Brigitta. The children have a good rapport with Anderson’s Maria, and all the production numbers are well-done, including the energetic “Do Re Mi” and “The Lonely Goatherd”. Visually, the production is impressive as well. Douglas W. Schmidt’s excellent set is notable for its period authenticity and colorful painted backdrops of beautiful mountain vistas, well-lit by lighting designer Natasha Katz. The costumes by Jane Greenwood are well-crafted and suited to the characters, from the nuns’ habits to Maria’s succession of dresses that range from the frumpy to the elegant. The children’s play costumes, supposedly made by Maria from the curtains in her bedroom, are appropriately whimsical. Maria’s hairstyles also go through a believable progression throughout the production, so kudos to hair designer Tom Watson for that effect. Overall, the tone of this production strikes a good medium between the classic and the new. There’s a sense of energy and urgency brought to the proceedings, as well as an authentic-seeming 1930’s sensibility and an “old Broadway” style without seeming too dated. It’s not trying to to overly innovative or different. It’s just trying to tell the story and tell it well, and for the most part, this iteration of The Sound of Music achieves that goal. It’s a delightful show. The national tour of The Sound of Music is running at the Fox Theatre until May 8, 2016. Oklahoma! is one of the most important musicals in the history of the genre. In fact, it’s often credited as the first “modern musical”, and it caused a sensation when it was first staged on Broadway in 1943. Since then, it’s become a staple of professional, amateur and school theatre to the point of almost becoming a cliche. A show like this needs a vibrant production to bring it out of the realm of “been there, seen that”. 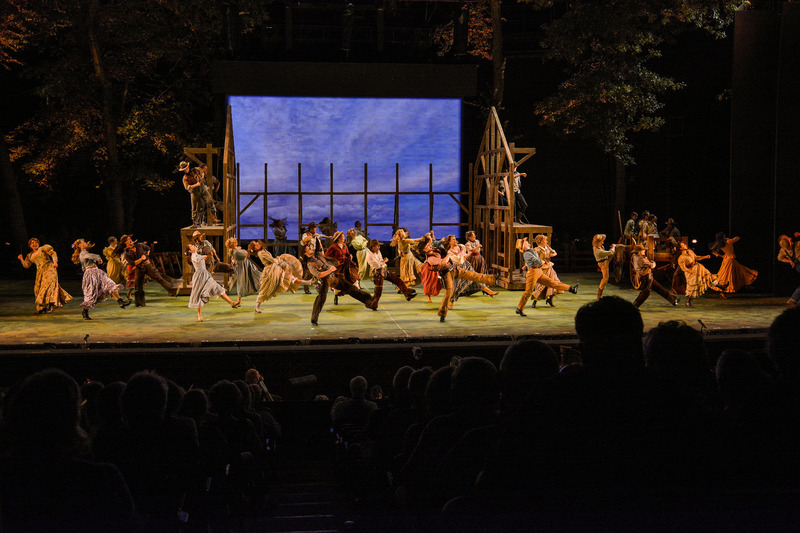 The Muny’s latest production, the final show of its 2015 summer season, has a strong production team and promising cast, and I had been looking forward to seeing it all season. Ultimately, though, while I find this production thoroughly entertaining, I was expecting “amazing” and what I see here is simply “very good”. This is a familiar story to many, as iconic as this show has become. The opening, as cowboy Curly (Ben Davis) starts singing the glorious “Oh, What a Beautiful Mornin'” offstage before he appears to serenade Aunt Eller (Beth Leavel) is legendary. The story goes on to follow the awkward romance between Curly and Aunt Eller’s spunky niece, Laurey (Christine Cornish Smith), who is also being pursued by the intense, stalker-ish hired hand Jud Fry (Alexander Gemignani). Meanwhile, Laurey’s friend, the amorous Ado Annie (Jenni Barber) enjoys flirtations with various men but finds herself torn between her earnest suitor Will Parker (Clyde Alves) and a traveling peddler, Ali Hakim (Nehal Joshi), who just wants a fling with Annie but her protective father (Shaver Tillitt) has other ideas. The classic songs are here, from the romantic “People Will Say We’re In Love” to the energetic “Kansas City” to the iconic title song. It’s a show with humor, drama, romance and a lot of energetic dancing, done very well in the Muny’s production. The choreography here is recreated from Susan Stroman’s work for the celebrated 1998 London revival and its 2002 Broadway staging, and the dancing is the real highlight of this production. Notably, the “dream ballet” is danced by the performers playing Laurey and Curly, rather than by dance doubles as in the original production. I like this new convention, since it adds a sense of immediacy to the ballet that previous versions tended to lack. Smith especially is an exceptional dancer, and she brings out the full range of Laurey’s emotions–from fear, to hope, to doubt, and more–in her dance. The whole company does an excellent job all-around with the dancing, as well, from the vibrant “Kansas City” number led by the dynamic Alves as Will to the whimsical “Many a New Day” for Laurey and the female ensemble, to the raucus “The Farmer and the Cowmen” production number in Act 2. This is a wonderful show for dance, and the Muny does it right. The casting, for the most part, is strong, although this production has made a choice that I’ve often regarded as a mistake–it’s cast a Curly who, despite his excellent voice, is too mature for the role. Davis, who was wonderful as Emile DeBecque in the Muny’s South Pacific a few seasons ago, sings the songs beautifully, but isn’t entirely convincing as a lovestruck young cowboy. The dialogue for this show suggests that Curly isn’t that much older than Laurey. He isn’t Emile, or Captain Von Trapp in The Sound of Music. Those shows require an age difference between the romantic leads, but in this show, that doesn’t really work. Opposite Smith, Davis doesn’t convince. Their chemistry is awkward at best, although Smith gives an otherwise strong, gutsy performance as Laurey, and she has a great voice. Otherwise, it’s a good cast, with Leavel as the feisty Aunt Eller and Gemignani as the creepy Jud being the standouts. Alves and Barber make a sweet pair as Will and Ado Annie as well, although their Act 2 duet “All Or Nothing” lacked some of the comic spark that this song is supposed to have. Joshi as Ali Hakim gives a fun comic performance, as well, and the ensemble is first rate, especially in the dance numbers. Another highlight of this production is its wonderful production values. Michael Schweikardt’s set is beautfully detailed, with a realistic farmhouse on the turntable that rotates to reveal Jud’s rundown smokehouse. In Act 2, the unfinished structure of the community’s schoolhouse makes a striking backdrop for the action of the show. The costumes, by Martin Pakledinaz with additional design by Amy Clark, are colorful and appropriately evocative of the period and characters. John Lasiter’s lighting is striking as well, lending a dreamy air to the the ballet sequence especially. The outdoor setting is also especially kind to this show that mostly takes place outside on the broad plains of Oklahoma. Oklahoma! is the very definition of a classic musical, and it’s a fitting show for the Muny, which is an icon in itself. I’ve come to expect a little more from the Muny lately, especially in the last few years, and this production is certainly entertaining. Although it’s not exactly the exceptional production I had been hoping for, it’s still a fine production, and a good show to close out the Muny’s 97th season. Oklahoma! runs at the Muny in Forest Park until August 16th, 2015.